Stan the turkey spent the first twelve weeks of his life locked in a greenhouse where his only contact was with the human who fed him once a day, and the elderly dog who occasionally sneaked in to stretch his aching joints in the sun. 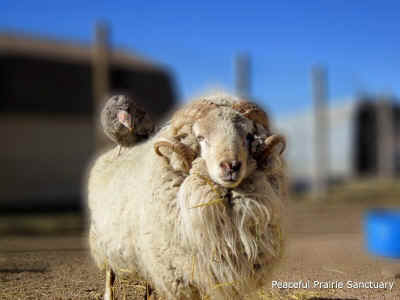 So, when he first arrived at PPS—a thin, fuzzy ragamuffin of a poult, covered in scraggly down and unruly spikes that hadn't yet fully unfurled into feathers—his first and most forcefully expressed desire was not to join the community of sanctuary birds, or to connect with the other turkeys, but to break free: first from the crate he had arrived in—whose walls he attacked with all the rage in his caged bird body—then from the confines of the bird barn, then from the distant boundaries of the main yard, then farther still, aiming at and beyond the sanctuary borders, if allowed (which, for his own protection, he was not). A month later, he continues to reject any enclosures no matter how large, always finding ways to escape from any yard into the wide open fields. If this is a reaction to his early confinement, it's also, in equal measure, an expression of his personality. Stan is outgoing, curious, athletic, self-reliant and, most of all, filled with what can only be described as wanderlust. To him, it seems, the best place in the world is the place just beyond his reach, the place beckoning in the distance. 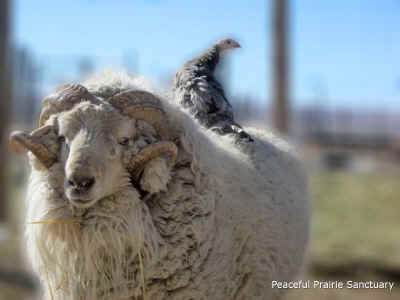 And, while he remains uncertain of his place and role in the turkey tribe, or the larger bird community, he is perfectly at home with Marley the sheep. Not because, as it's tempting to assume, Marley reminds him of the dog in the greenhouse, but because with Marley, Stan can be perpetually en route to that distant place, forever defying fences, barriers and borders of all kinds. And, most importantly, he can do so with a fellow whose mood, like his own, is to travel.